Get ready to ride into the sunset, with the strikingly beautiful Doodle and Crumb infant rocker from our friends at Little Bird Told Me. 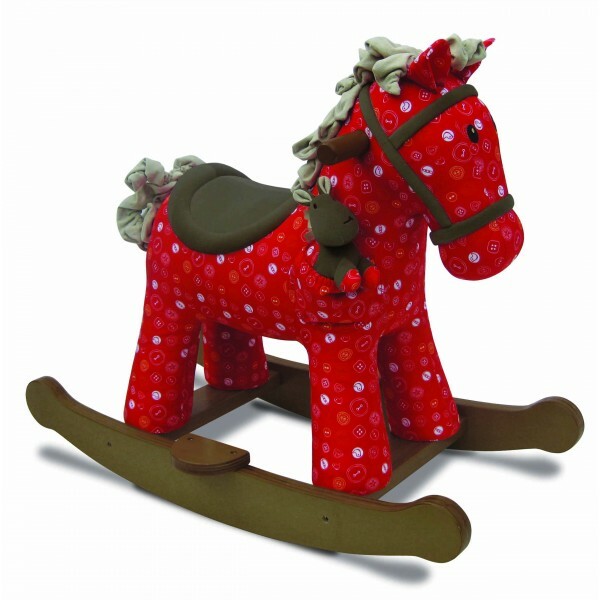 A beautifully made rocking horse specially designed for little children, Doodle carries his friend Crumb, a smaller removable soft toy pony, in his pocket wherever he goes! With a super soft and stylish fabric print body and a scrunchy faux suede mane and tail, as well as a sturdy wooden frame that comes complete with detachable footplates, Doodle and Crumb is a stylish, safe, and wonderfully well made rocking horse, that's sure to delight any little rider. This is a stunning rocker that manages to feel totally traditional while at the same time looking contemporary and hugely stylish - it's vibrant red colours will stand out in any bedroom or playroom, (especially at Christmas time). The super cute soft toy that sits in the pocket of the rocking horse is a quirky little touch that children absolutely adore. Doodle and Crumb is designed for younger children with safety in mind - we love the way the rocking panels are cut to avoid tipping and excess motion.